Have this much fun spreading a great message? Feel a part of something bigger? Contribute to world peace by becoming peaceful inside and with others? Spend so little to spread so much happiness? to do this. Play, Display, and Send a message of Peace out to the world by getting your own Bead Person. 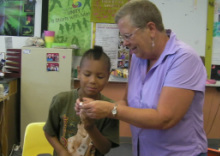 The Bead People International was started by author and communications trainer Patricia Jamie Lee. Be sure to visit her blog, No Ordinary Life, to read stories and articles about what it means to be a conscious and awake human being. She is supported in all ways by her husband Milt Lee. been to . . .
Women's retreats, Boys and Girls Clubs, Schools (1-9), church groups, adult conferences, peace events, home parties, birthday parties, family reunions, martial arts events, farmer's markets, festivals, college classes, globalization events, green events and they are only waiting for the next invitation! The Bead People love a Peace Party! Go to the How to Host an Event page for more info. Jamie and Milt also come and do events when possible. Britain, Egypt,. Spain, Italy, . . .